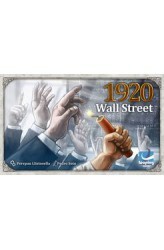 In 1920 Wall Street, a card game for 2 to 5 players, each player tries to collect shares from four different companies (corn, cotton, steel and oil), sell them if they need money, and influence the value of the different companies in the stock market. They earn points for making the market fluctuate and for the shares they collect — if they reach the minimum quantity of each kind! Everything with the background of the Wall Street Bombing that occurred in 1920 at the Financial District, in Manhattan, will trigger the end of the game and make some changes on the way it is scored. These changes are affected by the way players discard their cards during the game. https://www.youtube.com/watch?v=tMBJAr3eJiE ..
1916, Europe: The Great War has ravaged the land. Only one fertile ground remains and it is strongly disputed...by moles? In Topoum, you control an army of moles that are fighting for control of a piece of fertile land in the middle of the Great War. The moles are well known for their blindness and, for this reason, you'll earn badges (points) if you can form uninterrupted lines of sight between your soldiers. 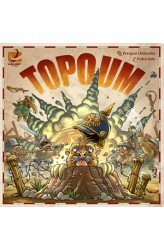 Topoum features several different types of cards of four categories: combat, movement, expansion and special. Each game is different because you build the playing deck with seven types of cards (+110.000 combinations!). Each player has a private hand with two cards and there is a public row of five cards available for all the players on the board. This is the..